I love long drives and the excitement of discovering what’s new in my own city. Most of the time on these drives, my car mysteriously ends up at Ranch 99 or some other international market. On Saturday, I ended up at three different places. I took a long drive down University Avenue and ended up at a little Asian market, where I slowly roamed the aisles, trying to decipher the uses and tastes of some of the more interesting ingredients. I found some amaranth leaves, and picked them up, not knowing what I’d do with them. They luckily found their way into a dal for last night’s dinner. I then crossed the street to find a Middle Eastern market – I was mainly drawn there by the signs advertising whole goats. Yikes. It was a score, though, because I found a huge bin of green coffee beans, just ripe for the roasting! Finally, I ended up in Clairemont at Ranch 99. I can spend hours here, just walking around, boba drink in hand. The produce section alone provides plenty of entertainment. 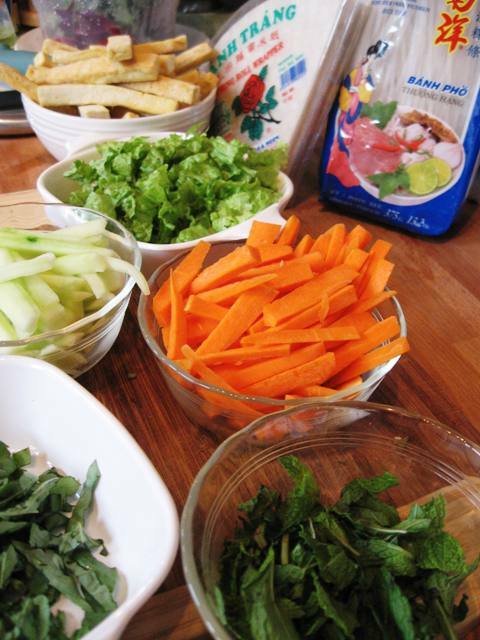 This time, though, I had a mission – on a hot sticky day, nothing sounds better than fresh spring rolls. I picked up some rice paper, rice noodles and tofu and got to work. First I harvested some lettuce, basil and mint from the garden, fried the tofu until golden, and julienned some carrots and cucumber. The rice noodles I picked up were a bit bigger than the ones I’ve used in the past, so they required a few minutes in boiling water. Typically, thin rice noodles only need to be soaked in hot-from-the-tap water. 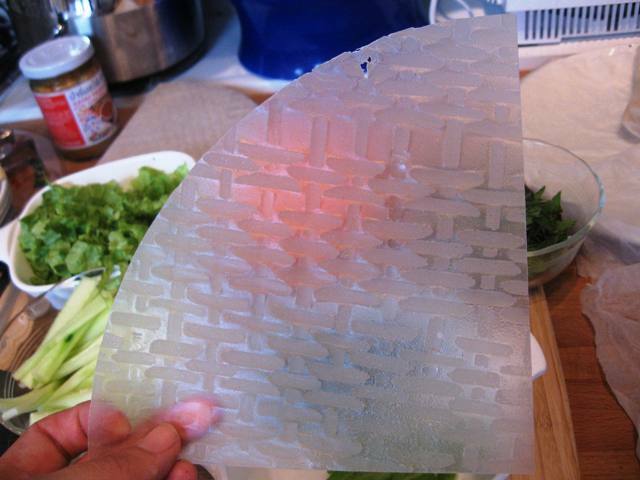 I bought a new shape of rice paper this time also – the package claimed that these were “good for restaurants”, so I figured they’d be good for me too! You can use the still-hot rice noodle water to soak one of these papers at a time. They only need about a minute in the hot water to become pliable enough to work with. Be sure to lay out a damp dishtowel to lay these on, as they need to be kept moist throughout the process. Lay your rice paper down, and fill the center with as many of these goodies as you’d like – I packed each full, a little from each bowl. Roll them up, transfer to another damp cloth, and begin again with another sheet of rice paper in the hot water. If the rice paper rips while rolling, simply soften another sheet and make it a double wrapper. I served these with some storebought barbequed pork buns and (embarrassingly easy to make, but) jarred peanut satay sauce. Delish. And as my mother would tell you, no Asian meal is complete without a flaky, buttery, creamy fresh egg tart at the end. This one’s for you, mom. 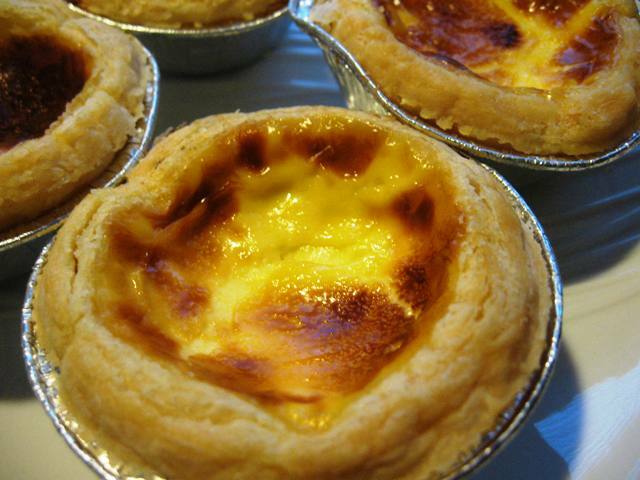 Makes me hungry for spring rolls, pork buns and, my sweet tooth’s favorite, egg custard tarts. Brings me back to all the trips to Chinatown in San Francisco when you were little. Sounds delicious. Good job! Okay, this is getting scary (cue Twilight Zone music); we had spring rolls on Saturday also. We haven’t had them in years but since I’m trying to cook low fat, these were perfect. 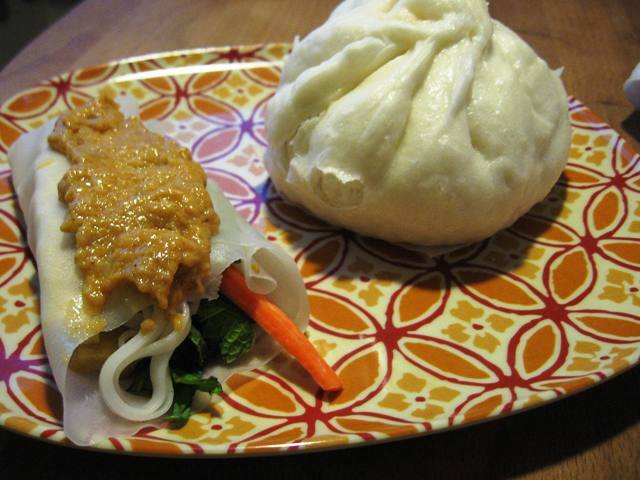 I’ve never had ANY chinese buns. What does the doughy part taste like? Oh, I guess I could pick some up and try them, duh. I was in Chinatown yesterday, and ogling all the veggies and fruits that we can never get in Utah. If I lived in San Francisco, I would totally try to live in Chinatown. I spent a year and a half in the Philippines, so I learned about a lot of the Asian produce. If you ever have questions about preparation, I might be able to help.